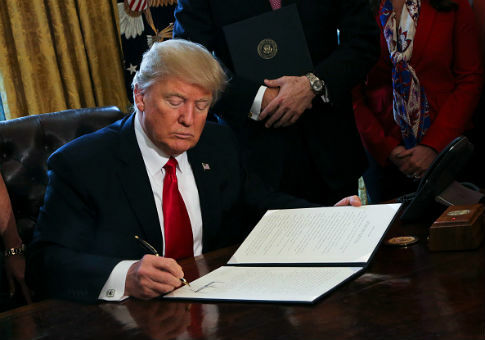 President Donald Trump signed the "the single largest bill to combat drug crisis in our history of our country" into law on Wednesday, expanding Medicaid’s reach and emphasizing medication-assisted drug abuse treatments. Trump signed the legislation into law Wednesday afternoon during an event at the White House. "Together we are going to end the scourge of drug addiction in America," Trump said. "We are going to end it or we are going to at least make an extremely big dent in this terrible, terrible problem." The legislation, the SUPPORT for Patients and Communities Act, passed the Senate 98-1 earlier this month. It is a compromise reached between Republicans and Democrats in both chambers after months of deliberation on how best to combat the opioid epidemic, which contributed to roughly 115 overdose deaths per day in the U.S. in 2017. The law includes provisions for empowering pharmacists in the fight against opioids, for the safe disposal of unused medications, and for the transfer of controlled substances being illegal trafficked to Customs and Border Protection. Rep. Cathy McMorris Rogers (R., Wash.), the chair of the House Republican Conference, said in a statement, "This is the most comprehensive action we’ve taken to combat the opioid epidemic. It will bolster treatment and recovery initiatives, improve prevention, protect our communities, and fight synthetic drugs like fentanyl that are coming across our borders from China and Mexico." First Lady Melania Trump also spoke in favor of the legislation. "We must come together to fight this epidemic by providing as many resources as possible and I know that as long as my husband is in office, this will remain a priority," the first lady said. The legislation also received the endorsement of the USA Today editorial board, who wrote on Tuesday that "Once the law is signed by the president … federal prosecutors will finally be able to go after patient brokers and the providers who pay them. Conviction for taking or providing kickbacks will carry criminal penalties of up to 10 years in prison and as much as $200,000 in fines." This entry was posted in Politics and tagged Donald Trump, Opioids. Bookmark the permalink.